Sorry, no Easter Egg link in the post title. You hadn't noticed? The green box represented the firm management committee imperative: improved financial performance. The blue boxes were customer behavior changes we needed to effect to get there, and the order in which they would progress. The red boxes were the internal processes that would need to be transformed to develop customer relationships. They purchase and believe in your product or service. They are loyal and passionately recommend you to friends, neighbors, and colleagues. They purchase your products as gifts for others. They provide unsolicited feedback or praise. They forgive occasional dips in service and quality; they let you know when quality slips. They are not bought; customer evangelists extol your virtues freely. As your evangelist, they feel part of something bigger than themselves. A long term relationship is one which lasts beyond the term of an initial engagement. It should span multiple engagement, not necessarily contiguous. Relationships here are defined as person-to-person. The kind of relationship we want to develop is a trusted advisor relationship. The ELFEC trust development process describes generically the evolution of trust in an interpersonal relationship – including successful consultative interactions. We aspire to develop trusted advisor relationships with key C-level executives and other decision makers (and check signers) within accounts in [our territory]. 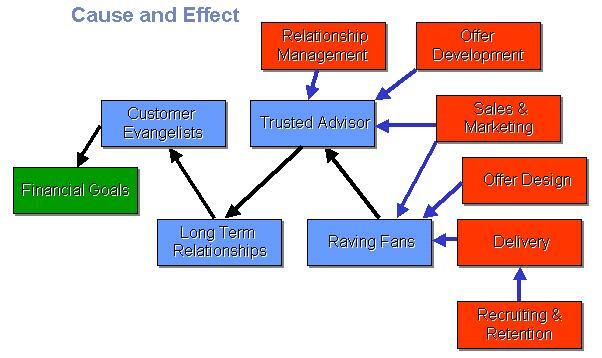 The key difference between raving fans and customer evangelists is the depth of commitment and breadth of relationship with the individual evangelist. Each and every one of our engagements should aspire to create raving fans / delighted customers, even if the client never uses us again. If we are successful, they will often find ways to engage us again, which gives us the opportunity to build a trusted advisor relationship. Every single employee involved in customer-facing processes is responsible for the customer delight creation process. The process by which we cultivate and nurture trusted advisor relationships with key client individuals. It consists of a series of processes to identify potential target individuals for a trusted advisor relationship, match an appropriate advisor to the client, and actively managing the relationship on an ongoing basis. We will need to define the specific processes and tasks as part of building our trusted advisor program. We will also actively manage client relationships that are not trusted advisor relationships. This will be done in a more traditional account management framework, but will involve more conscious planning than we do today. Offer development is the process of creating standard mass-customizable technology/business solutions for offer to our customers. The deliverables are intended for our sales, trusted advisor, and delivery teams. Each offer provides tools for developing business justification, risk assessment and cost estimates for completing initiatives. Offer design is the process of taking a developed offer and tailoring it for a specific customer. This will generally be done as part of a trust-building experience / assessment project. The deliverables are a business justification, risk assessment, and cost estimate for full implementation of the initiative. This information will allow us to create alternative billing arrangements for the full initiative. Planning includes understanding not only the entire scope of the project, but the customer satisfaction attributes, including delight-creating attributes, of the project as well. Insuring customer delight encompasses not only traditional QA, but also managing customer expectations and ‘selling’ the project. Most of our customer relationships will not evolve into trusted advisor relationships in the short term, and many will not in the long term. We will constantly be looking for new companies to work with, and exploring new business units and groups within existing accounts. Trusted advisors manage specific individual relationships, and will not be able to cover every conceivable opportunity within large organizations. In fact, the value of having a trusted advisor relationship may diminish in the eyes of those special clients if the services are available to everyone in the company. This work – “hunting” for new business, will be the responsibility of our business development team. Marketing comprises the set of activities that we engage in to develop initial leads for business development and trusted advisors, and includes the development of materials for use in the sales process. We thought it was brilliant, but it was a little too far out of the box for the management committee. We presented. Crickets chirped. Most of the original group is no longer with the firm. But I still think it's good stuff, and somebody ought to be able to put it to good use. What do you think of it?